Prime Minister Manmohan Singh . PTI. 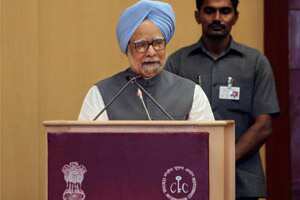 New Delhi: Prime Minister Manmohan Singh will embark on a visit to Pretoria on Monday to attend the trilateral India-Brazil-South Africa (IBSA) summit that is expected to be dominated by pressing global issues like the difficult economic scenario and security situation. During his three-day visit, Singh will also have bilateral meetings with Brazilian President Dilma Rousseff and South African President Jacob Zuma. It will be preceded by the trilateral meeting of Foreign Ministers and forums on various topics like Commerce and Women and Child Development. An agreement for setting up of a Diplomatic Academy will be signed after the Summit. One of the important issues to be discussed at the summit would be the current global financial and economic situation, officials said here. The three leaders will discuss possible steps that need to be taken to address the economic situation, which has become difficult in view of crisis in Europe. The discussion on the global financial situation and coordination of views would be significant as all the three leaders would be attending the G-20 meet in Cannes early next month. Issues related to international security like terrorism and maritime safety are also expected to be discussed. The leaders of the three countries, which are aspirants for permanent membership of the Security Council, are also expected to discuss issues related to UN reforms. The three countries, all non-permanent members of the Security Council, have demonstrated coordinated actions in the recent past on Syria. In the backdrop of representatives of India, Brazil and South Africa visiting Syria, the leaders of the three countries are expected to take their discussions forward on the issue. Singh, Rousseff and Zuma are also expected to discuss issues related to the IBSA Trust Fund, which is used for joint developmental projects in under-developed countries like Palestine and Haiti. Each country contributes $1 million each year to the Fund. India has been maintaining that the relevance of the IBSA will remain as it brings together three large democracies of three continents and is not undermined by the Brazil-Russia-India-China-South Africa (BRICS). External Affairs Ministry spokesman Vishnu Prakash recently said the IBSA was a forum of like-minded developing countries and there was no “ganging up" against anybody.